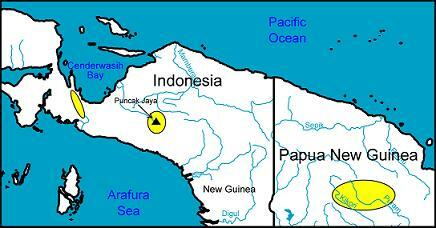 Etymology: Named for its island of origin, Papua (New Guinea). Most plants in cultivation under the name Paph. papuanum are actually color forms of Paph. violascens. Paph. papuanum has proven to be very difficult to grow from seed. However, I have heard of two nurseries that have had some success and artificially propagated seedlings may soon be available. This species is one of the rarest in cultivation and only three collections appear in the literature. The type specimen was collected during the Wollaston expedition to Mount Carstensz (now Puncak Jaya) in 1913. In 1961, it was recollected by Zieck in the Arfak Mountains. This taxon was redescribed as Paph. zieckianum by Gustav Schoser, who either did not recognize it as the 'lost' Paph. papuanum or was unaware of the original description (more likely, given the many documents lost or destroyed during the Second World War). A third collection was reported by Reeve from Southern Highlands Province in Papua New Guinea. Despite its infrequent mention in the literature, a number of collections by commercial dealers have been made and the plant has been [illegally] exported. Azadehdel, H., and P. Mattes. "The Rediscovery of Paphiopedilum papuanum and Paphiopedilum zieckianum." Orchid Digest 52, no. 1 (Jan/Mar 1988). Millar, Andree. Orchids of Papua New Guinea. Portland, OR: Timber Press, 1999.